Probiotics are probably one of the most varied and confusing supplements available. There are over 200 strains of probiotics and not all are equal in effects or in benefits. Dr. Wanda spent months researching the best recommendations and reading the current literature to identify the top 9 strains to include in our Probiotic Power Blend. 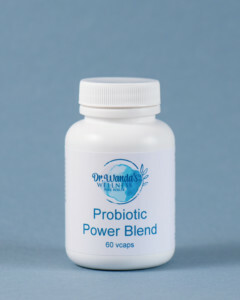 We have included key probiotic strains that are temperature and acid resistant so they make it through the stomach and into the intestinal tract for more effectiveness. We have chosen key strains to aid in fighting pathogenic microbes and assisting with H.pylori, vaginal and urinary tract infection management and prevention. We have added strains to reduce ulcer risk and aid in managing food allergies and irritable bowel symptoms. Taking a probiotic supplement can be very helpful, but only if the right probiotics are inside the capsule. Compare ours to most others on the market and we know you will agree that this is the best value for the best quality! These come in 30 and 60 capsule bottles. They have a 2 year potency effectiveness when refrigerated and are shelf stable with no loss of potency for 2-3 months.